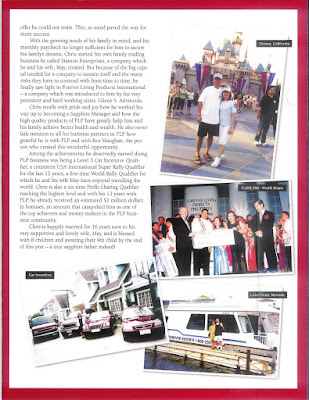 This a true story of my coach and friend Chris SantaMaria, he is in the Philippines but his FLP business running around the world, I saw the in my own eyes the checks he received at the beginning and now i like and respect this man.... Forever is an amazing business to put your efforts in. لقد رأيت بعيني الشيكات التي حققها في بداياته و الشيكات التي يستلمها الآن. Are you getting your recommended 5 servings a day of fruits and vegetables? Forever Living knows that good intentions of eating a balanced diet are not always met. Just 4 tablets give you the antioxidant equivalent of eating 5 servings of fruits and vegetables a day. Forever Nature's 18 is a pleasant-tasting, easy-to-chew tablet that delivers your daily requirement of antioxidants from fruits and vegetables. 4 tablets give you the antioxidant equivalent of eating 5 servings of fruits and vegetables a day. Chewable, great tasting tablet - ideal for the entire family!